Back up the hill for 8am Frustuck at Mezni Louka – a Cesky breakfast with cucumber, tomato and capsicum. We inconspicuously organised lunch as well. Then off along the walking track 6km each way through birch and beech forest to Pravcicka Brana (pr. Pravchitska), a famous rock formation, beloved of Czech and German tourists. According to our map, it was formed a million years ago, and is expected to last only another 10,000 years, so geologically speaking, we were just in time. The Sachsonische Schweiz has sandstone formations everywhere. 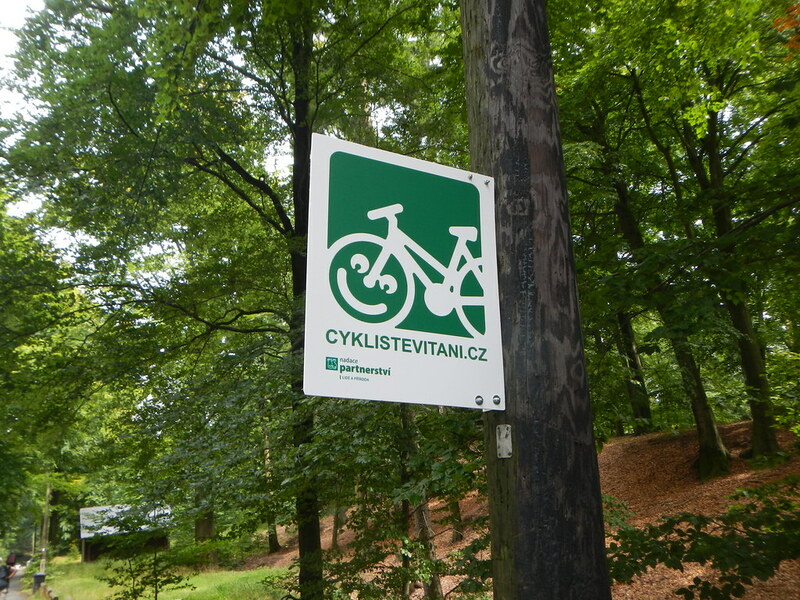 Some of our limited Czech vocabulary came back to us, and we exchanged many dobry dens with fellow walkers of all shapes, sizes, ages and states of health. There are low traffic roads throughout the national park. We took the route suggested by Alex. On the way through we saw a log truck, lots of mossy rock outcrops, hikers and mushroom pickers with their cane baskets. There were a couple of longish steep hills – Alex would be proud of us as we did them by pedals all the way. A long descent brought us to Varnsdorf, the last Czech town before entering Germany again, then to Zittau. We managed to get through Czech without changing money! Before dinner we went to the Dreiländer Punkt where the borders of Germany, Czech Republic and Poland meet. You can get to this spot only by walking or riding. It is marked with the flags of the 3 countries and the EU, on the river Neisse which we will be following from tomorrow. This entry was posted on 29 August 2014 at 8:09 pm and is filed under Europe 2014. You can follow any responses to this entry through the RSS 2.0 feed. You can leave a response, or trackback from your own site. It is a beautiful area where you are!